The Service Program was created exclusively for QuickBooks™ users. As a QuickBooks add-on, it enables you to add industry-specific functionality to your existing accounting software without having to learn a new program or manually enter existing data. The Service Program seamlessly integrates with QuickBooks (2014 or newer, Pro, Premier, and Enterprise or Online) . Our Tech Support professionals will simply install The Service Program and it will synchronize with your QuickBooks. Automatically import all your customer records from QuickBooks with one click! Not only will you save time by not having to enter data twice, but you’ll also avoid costly data entry errors. In addition, The Service Program automatically synchronizes with QuickBooks when the first person logs in each day, so you don’t ever have to wonder when they were last synched. Plus, future additions and changes made to customer records in either QuickBooks or The Service Program are automatically updated in both programs. When you create an invoice in The Service Program, whether from a desktop PC or from mobile devices, it can be posted into QuickBooks as an invoice, so there is no need for dual entry. And when you add an inventory item from QuickBooks, The Service Program will automatically deduct that item from its QuickBooks inventory records. The Service Program also gives you the capability to receive payments in the field through a mobile device or from a customer portal. This payment records right into QuickBooks just like if you were to enter a payment directly into QuickBooks. We work with a number of payment processors as well! 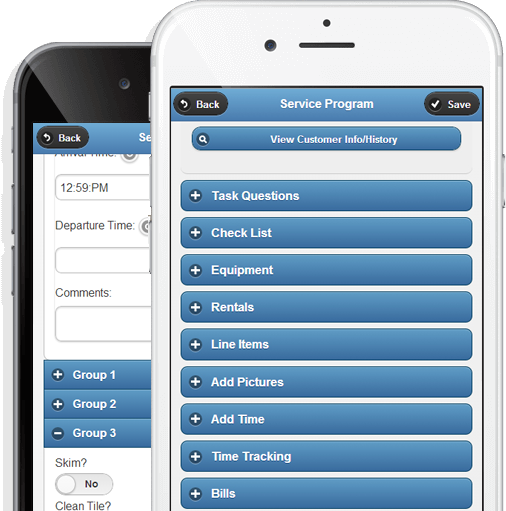 The Service Program also gives you the ability to work with classes, sales reps, QuickBook templates and more! Take a look at the Weekly Training Webinars we offer. Our goal is to help you leverage the technology and tools you have at your disposal to improve your business operations. That’s why we want to help you understand how to maximize the power and efficiencies of QuickBooks, especially when used in conjunction with The Service Program. You control who has access to your QuickBooks file. This means you could have people in your office that will work with The Service Program that you DO NOT want to work in QuickBooks. For each user license of The Service Program that you purchase/subscribe to, you will receive one QuickBooks link license. This gives you the ability to sync with QuickBooks from that one user. So, if you have a two user Service Program license, two people will be able to synchronize with QuickBooks. If you upgrade your version of QuickBooks in the future to a newer release, there is a nominal fee to link per PC.